Aroma: Lots of alcohol. Notes of vanilla and spearmint. Taste: Peppery, fiery, a bit oily; some oak and spice; finishes with that “zing” of mint. Verdict: Henry McKenna pours out a light amber, but don’t let that fool you. This is one aggressive bourbon. I started out sipping it on the rocks but enjoyed it more after adding a splash of water. It engages the entire palate, but does have a pretty mellow finish. 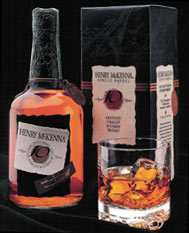 If you prefer a sweeter bourbon, this isn’t for you, but if you like your bourbon full-bodied, give Henry McKenna a try.